In September 1982, I went to a friends and saw a commodore 64 for the first time, spent a day typing in and playing with the balloon program from the book of basic that came with it! I loved it so much the very next day I went and got £250 worth of credit at Dixons and brought a C64 and tape deck. I spent every free minute playing with my new toy, as soon as I got home from work till the early hours in the morning and all weekend. It took a while to master but I did manage to write a couple of half decent things in basic. The first one was similar to scramble with spaceships on the right and your ship on the left that could fire at the spaceships and only collision detection was for the bullets and ships. Just after that I wrote a sprite editor in basic, so I could make better game sprites, It was not long after that was done that I discovered machine code, so I started playing with that through a monitor cartridge writing directly into the memory. The first thing I did was made a clone ofHunchback by Ocean a boy having to get from the left side of the screen to the right, mine was called Cyril and was similar but not a copy as I had different obstacles, but looking back now it was not that great. It was at that time that I saw an advert in one of the games magazines, Telecomsoft wanted games, so sent Cyril off to them to see if they would publish it, after a couple of weeks I received a phone call asking me to visit there plush London offices. I asked for a day off work and my boss at the time said no, so I left resigned from and left work there and then. I went to the meeting in London where they showed me another game called Happiest Days of Your Life on the Sinclair Spectrum, they asked my opinion and I told them is as a good game, but to be honest it was average, but after leaving me with the game for a while they told me to go home and the meeting was over. I went home all fed up and confused however a bit later during dinner I received another telephone call from Colin Fuidge at Telecomsoft, who offered me £2000 to port Happiest days to the commodore 64, and it had to be dome two months, so of course I said yes. It took me about 10 weeks and I lost £500 in penalties, but it was the start of a career lasting over 30 years. 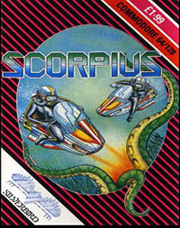 I wrote a game called Scorpius back in 1983, which was a horizontal shoot em’ up, that started as a piece of code I was I wrote to create full screen parallax scrolling which at the time was unheard of on the little old commodore 64 with its 1.023Mhz processor. The Commodore 64 had programmable character sets which were used to create the art for the backgrounds in about 90% of the early commodore games, the best feature of using this method was that we could draw them very fast with one read and one indexed write to the screen per character which was 8×8 pixels of screen space, and if you changed the graphics for the character then all of those characters on the screen would change at the same time. To do a sideways scrolling game in those days was relatively easy as the whole screen could be shifted up to 8 pixels in both horizontal and vertical directions. So we would shift it one a pixel a time and when it reached 8 pixels we would shift the whole screen of characters over and reset the fine scroll position. Anyhow I came up with this idea of rotating some of the raw character graphics that were used on the backgrounds of the game, which created the illusion of parallax scrolling. I designated some of the characters to be ones that I could use on the edges by ORing the foreground graphics over the backgrounds which make the edges look a lot less blocky. It was at this time I moved into a small office in the centre of Chelmsford in Essex and I started thinking about growing into a team, so I also put a small advert in the local paper looking for a Commodore 64 artist. And I got a phone call from two lads named Steve and John Rowland who you may know from Retrograde and the Creatures series of games. So I arranged to meet them in their parent’s house, I was ushered up to their bedroom where I remember looking at their very nice demos, they were very talented but had no outlet for that talent, John was doing some programming and Steve did art and music. So immediately I asked them to join me on Scorpius giving them the break into the games industry they needed. Steve made a fantastic job of the art, coming up with the underwater theme, while John and I did the programming and together we made Scorpius. We decided to make the game two players by using two of the 8 hardware sprites as player 1 and player 2, then reusing the remaining 6 sprites in my own sprite plexer, which was a method of retriggering the hardware sprites at new locations during the horizontal retrace, so the same sprite appears at more than one location on the screen. I think we spent about four months writing Scorpius and we got paid £8000, up advance, sadly it did not see any royalties that was expected as it should have gone out in the Firebird label and be sold for £5.95 as it was a damn fine piece of work even though I do say so myself. However it got pushed down by IO as the producer at Telecomsoft said that they did not want to have two competing games on the same label so it was relegated mine to the budget Silverbird label and sold for £2.50, personally I think they outlaid more in advance for IO and therefore needed get more back which was a shame. Later John and Steve founded their own company Apex and went on to produce some quality games of their own for Thalamus. 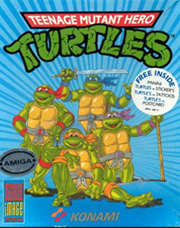 In 1990 I was asked to do the Atari St Version of Teenage Mutant Hero Turtles in two months for I think £8,000. They said it had to make the Xmas release period, however when I saw what Konami had done for the Amiga version I was shocked. I decided to do the Amiga version and the Atari ST at the same time and hopefully they would like both versions. I waited until they were 90% complete before I offered them both to the Probe who was creating all the versions for Mirrorsoft. I asked for £15,000 for the two versions a after Furgus McGovern discussed it with Mirrorsoft he said yes, to be honest how could they say no, it was cheap. It had to make the Xmas slots because Turtles where the big thing that year and to miss it would have been professional suicide. Probe sent two producers to stay with me with me for the last 10 days or so, they took turns sleeping. With the one that was awake, sitting next to me the whole time approving my changes, or suggesting things that needed to be done. I was working 36-48 hours straight, I eat and drank in my seat, when I was knackered or the room started to phase out I would go and sleep for 4 hours and then I would get back on it again for another 30+ hours. It had to be done no matter what, and of course it was, I did the Amiga and Atari ST in time, they made the Xmas slots, and Mirrorsoft made over £4 million from the Teenage Mutant Hero Turtles that year while I only got £15,000, but I was happy as for me £15,000 for two months work in the 90s I felt like a rock star. Needless to say I spent almost the whole of the next week in bed, but I did get a nice little surprise the following January, when I received an industry award for the highest game sales ever, which at the time was 80,000 units.